I feel as if this year has flown by. I can't believe that it is already October. I've done two full months of the internship with only eight months left. I've been blown away by what I'm learning already, and I think we've only scratched the surface. I can't even describe how blessed I feel to be getting to learn these things in classes with these amazing staff members, and then get to go out and do campus ministry as my job. I can't even thank you enough for help making this year a possibility for me and investing in me either with time, money, or prayers. It is only our third month, yet I know this experience will be life altering. I'm so excited about the things that are going on at TWU. We have two girls cores with about 10 girls in each. Our men's core has about 10 guys as well. THIS IS SO COOL! This is only the second semester that we've been an official student organization there. I can't wait to see how God continues impacting this campus. Next week we are having all the cores come together to worship and commune. I ask that you keep this event in your prayers. We are really trying to build a community at TWU and emphasizing the importance of being in a body of christ. This joint core is an awesome opportunity for us to share this vision with the students. We also have fall camp coming up which is another opportunity for the students on this campus to invest in these ideals. On another note, our outreach efforts on the Denton campuses have been going really well. Our theme these past two weeks is "God is...," and I think the students have enjoyed engaging in deeper conversations with their campuses. 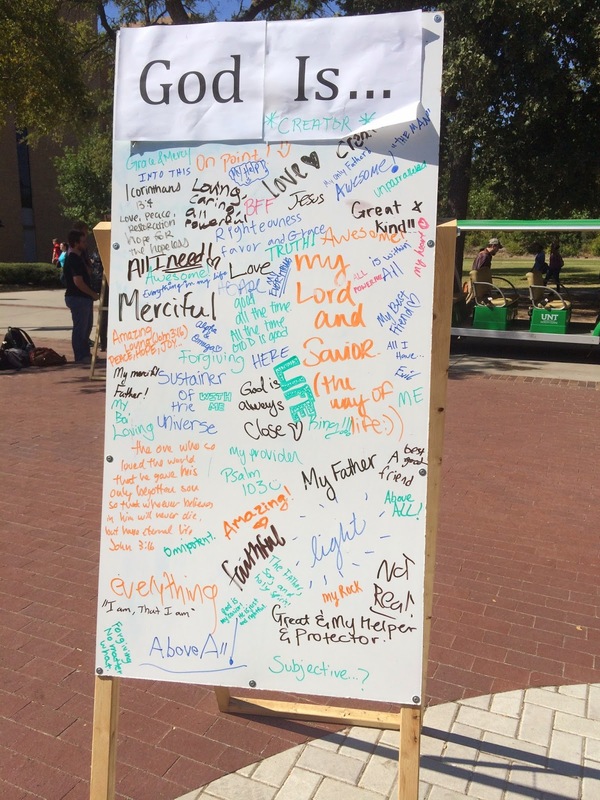 The picture below is of a few responses from UNT students. We actually had two boards, and we had to erase the boards several times because so many students were willing to write a response! Then Jesus told them, “This very night you will all fall away on account of me, for it is written: ‘I will strike the shepherd, and the sheep of the flock will be scattered.’ But after I have risen, I will go ahead of you in Galilee.” Peter replied, “Even if all fall away on account of you, I never will” “Truly I tell you,” Jesus answered, “this very night, before the rooster crows, you will disown me three times.” But Peter declared, “Even if I have to die with you, I will never disown you” And all the other disciples said the same. I think this verse really shows that Peter: cares about Jesus, believes in Him, and really thought that he was willing to die along Jesus if it came down to it. So how could He say that, and then deny Jesus? Well I think Peter was scared. He had spent all his time with this man for several months if not years, seen him do miracles and drive out demons. He believed in his authority. But now he was seeing him being beaten, mocked, and cursed. His messiah was now about to hang on the cross. This wasn’t the way he has expected things to end. The questions I imagine Peter asking himself are “was that all even real? Was I wrong for trusting him? What does that mean for all of us now?” I think the experience God work book would say this has led Peter to a “crisis of belief”. My second question then was how do our expectations influence our faith? As you all know fundraising is challenging, but extremely rewarding. This was my first experience really letting God take control. I had this assumption that if I was really doing what God wanted of me, He was going to do something miraculous. I had only been a Christian for three years; I knew my family wasn’t going to be able to support me, and I didn’t have a whole lot of other people to turn to and ask for support. In my mind I knew fundraising was going to be hard, but I had this subconscious expectation that I was going to struggle a little bit then God was going to do something big. Well I struggled a lot. This summer was one of the most difficult summers I may have ever had. I worked all the time. I was tired, and I became discouraged quickly. I really began to question whether God was real or not. I wasn’t sure if I trusted him to follow through. This was a big request; one that only he was going to be able to fill. Towards July I really had to re-evaluate this underlying assumption and get a clearer image of how God operated. I had to trust that he is lord, that he had things under control and was working, even if it didn’t seem that way to me- just like Peter. In my case and in Peters, it was in difficult situations where our expectations of how God worked challenged our belief. Lastly I wanted to end with another question: how are you letting your expectations influence you and your faith? I don’t think this is a question you can answer right now and maybe not even one you can answer within the following months, but it is a good one to continually have running through your brain. At some point you are going to be influenced by your expectations in a negative way, and you will be faced with a choice, just like Peter. You can deny God or trust that He is in control no matter what. What a challenge, Sarah! I am thrilled to see what you are learning already in your internship. Keep up the hard work, and God will continue to grow and teach you. I have loved hearing your thoughts in our meetings and Old Testament class.